For Year 11 students Prom Season is almost here – so we asked an expert (now in year 12) for her advice on planning your prom. We interviewed a young lady called Lucy who attended her prom last year. We picked her brains and found out what she enjoyed and if she would have done anything differently. It’s a day that goes very quickly so planning is important! Here are Lucy’s top tips for girls planning their prom. Ask in your local shops when the new season prom dresses will be in stock. The most popular styles go very quickly. Make sure you take plenty of time to go dress shopping. There are so many to choose from. I had in my head the dress I wanted, but I am glad that I tried on a few different styles to see which one suited me the most. Lucy got her dress at So Gorgeous in Weston-super-Mare but a quick Google search for ‘Prom Dresses near me’ will give you a good choice of local stores to choose from. Lucy sensibly suggests if you buy new shoes to match your prom dress, wear them around the house for a few hours so that your feet get used to them, otherwise, you could end up wanting to take them off when you’re on the dance floor! Check out different hairstyles on the internet so that you know which one you would like. 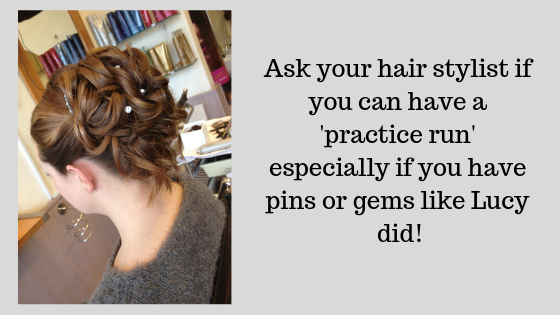 Ask your hairdresser to do a trial run so that you are happy with your style. Lucy went Hair At Houlahans, which was her local salon where she knew they could do a practice of her chosen style and try out the gems she wanted to use. If your dress is strapless or has a cut out back you might want to think about having a fake tan. Book this in plenty of time because it’s compulsory to have a patch test 48 hours in advance. Timing for this treatment is important – you want the tan it to settle and look natural on the evening of your prom so have it done a day or two in advance. Make some time to have your nails done before the day of your prom – the day of the prom goes very quickly so anything you can do beforehand will benefit you and stop you rushing and panicking. Get a trial run of your makeup! Ensure that you are happy and make a note of how long it will take to do so you’re not rushing. It is not necessary to have a partner, but many people take a +1, a best friend or agree with a group of friends to go together. If you do have a +1 it’s nice to be colour coordinated – often the girl’s dress with the boy’s tie. If it suits the style of your dress you could order a corsage for the wrist. Talk to your +1 or your group of friends about the style of car you would like to arrive in. A reputable chauffeur service will let you see the cars and sit in them when you visit so you can experience the feel of luxury and determine which vehicle suits you. Avoid leaving it to the last minute to book because, like dresses, the most popular cars get booked quickly. You might want a luxury silver or black prom car for just you and your +1 or maybe larger car for a few friends to share and spread the cost. 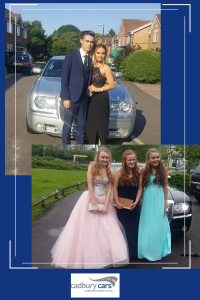 Ask us about your requirements contact us now, or call 01934 611 777 to see if we can help with your prom cars. Allow time on the day to take photographs. Your family will want lots of pictures and it is nice to look back on the day and remember – so be patient and smile.